The Abraham Lincoln costume accessory kit is part of the Heroes in History collection. It is used to create an Abraham Lincoln costume that can be changed into quickly making it perfect for book reports, school projects, or school plays. 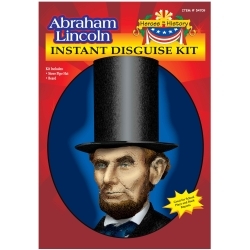 The Abraham Lincoln costume accessory kit includes a self adhesive beard and Abraham Lincoln's signature stove pipe top hat. One size fits most children.